The paper, published in Pacific Conservation Biology today, examined the role of advocacy in the management of these tall forests based on an analysis of statements in publications over 187 years. Lead author Adjunct Associate Professor Grant Wardell-Johnson, from Curtin's School of Molecular and Life Sciences, said the research identified an opportunity to implement policies to protect these forests despite the increasing predicament associated with warming and drying in the region. "While they occupy a minute fraction of the land cover of WA, these tall eucalypt forests represent significant environmental, economic and cultural values," Associate Professor Wardell-Johnson said. "Our survey of the history of management reveals many tens of millennia of interaction among people, climate change and south-western Australia's tall forests." Associate Professor Wardell-Johnson said people and the natural environment had been intrinsically and unmistakably linked over millennia. "However, this research reveals a fundamental shift in interactions between people and the environment once these forests were first logged 150 years ago. The predominance of a resource focus then disconnected people and the natural environment from these forests," Associate Professor Wardell-Johnson said. 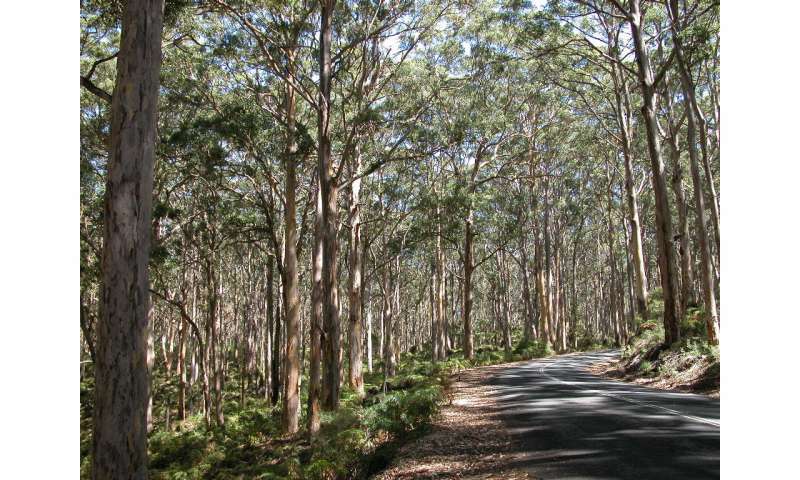 "More recently, society's values concerning tall eucalypt forests are shifting back towards recognition of important environmental and socio-cultural values; a pattern also recognised in other recently exploited but globally significant forest environments." Associate Professor Wardell-Johnson said WA's tall forests grew in a much more ancient landscape than their European counterparts, with trees living longer and hoarding their hard-won resources of water, carbon and nutrients. "Global warming and a drying climate in the 21st Century emphasises the importance of intact tall forests. While conservation advocacy has resulted in protection of nearly half the south-west's tall forests in statutory reserves, much more needs to be done," Associate Professor Wardell-Johnson said. "This study highlights the need for an exit strategy for the timber industry on public lands to allow a refocus on the values that society places on these forests, ensuring beneficial outcomes for forest workers, protection of important environments and validation for industry on private land."